New England has so many delicious and wonderful foods. It’s a pleasure to be from here and I try and not take living here for granted. In doing so I have spent a lot of time finding local farms and stands offering fresh produce from the area. And there are many. As our tastes and knowledge of food grows, we are seeking more and more fresh organic and locally sustainable foods. Some of my recipes have a story or history behind them and some of them, like this one, are just the product of existing recipes altered slightly to fit my tastes and the local produce in the area. It being winter, a bountiful season full of squashes, gourdes, root vegetables and the like, has given me a lot to choose from. In creating this canape for a menu,I wanted to really express this winter vegetable experience through simple yet complex flavors. Delicata squash also known as “sweet potato squash”, has a delicate flavor and when roasted, brings out a natural sweetness that brings a savory flavor right to the brink of sweetness. Paired with Tuscan kale, also known as “dinosaur kale” because of its bumpy appearance, the flavors work nicely together. The subtle earthiness & slight bitterness of the kale bring balance to the sweetness in the squash. The remaining ingredients that make up this hors d’oeuvre are few. Garlic, Extra virgin olive oil, Parmesan cheese and peasant bread remain to keep the flavors prominent and not masked by an overflow of flavors. The end result is a flavorful, complex, yet simple grouping of flavors presented in the form of bite size finger food. Heat a cast-iron grill pan (I used a small Gearge Foreman grill that had ridged surface creating great grill marks). Brush the bread with olive oil and grill over high heat, turning once, until toasted. 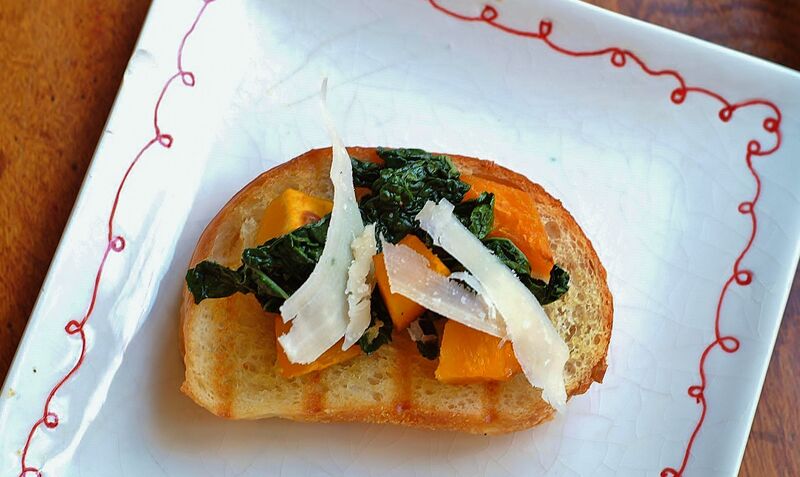 Mound the squash and kale on the toasts, top with the shaved cheese and serve. This can all be made ahead of time except for the bread. Cook and cool the filling and cut the bread and grill or sear just before serving.